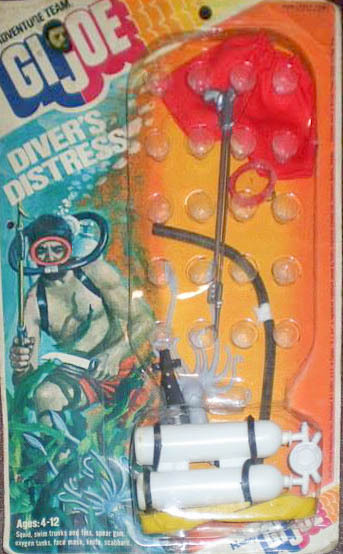 Though very hard to find on the card, Diver's Distress (7328-6) is a pretty minimal set, consisting of red shorts and face mask, white scuba tanks with an open-back regulator, an unpainted spear gun, and the saddest of all the Adventure Team animal opponents, a tiny squid, not nearly as fierce as it's big brother from the Fantastic Sea Wolf. The squid isn't even molded in three dimensions, it has an open back. 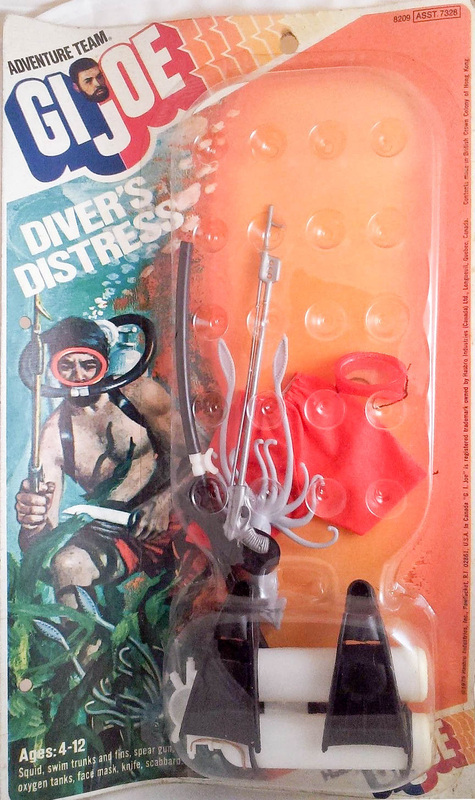 The set is reported to have a few variations, including silver diver tanks, yellow fins, and a pinkish face mask. 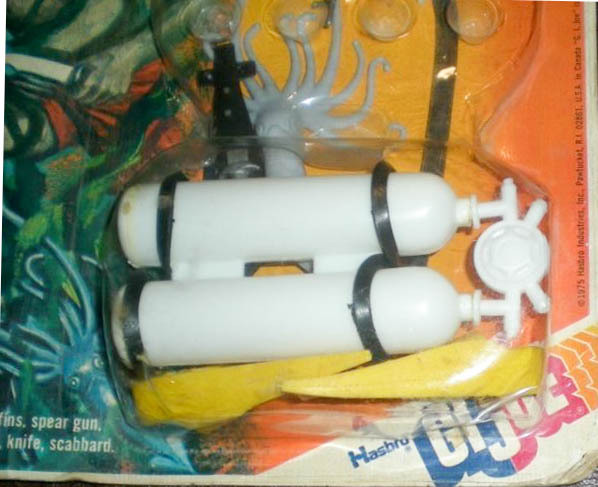 To my knowledge, these variations have not shown up in a sealed set, though they are available in other configurations, such as the Defenders Sea Recovery (silver tanks), Action Man scuba sets (yellow fins), and knock-off scuba gear (the pink mask) so the jury is still out on how authentic they are. The card show below is shared courtesy of Jake's Toy Chest. Check out his eBay auctions here. If you can help the site by providing an image of the set with silver tanks, please contact me. ​Collector Eddie Perez shared the photos below and right of an example of the set with yellow fins. If anyone has evidence of the set being sold with silver tanks, please contact me. Left, the deadly micro squid. Center, the set's white tanks and the silver tanks that may also have come with the set. They were definitely available with the Defenders Sea Recovery set. 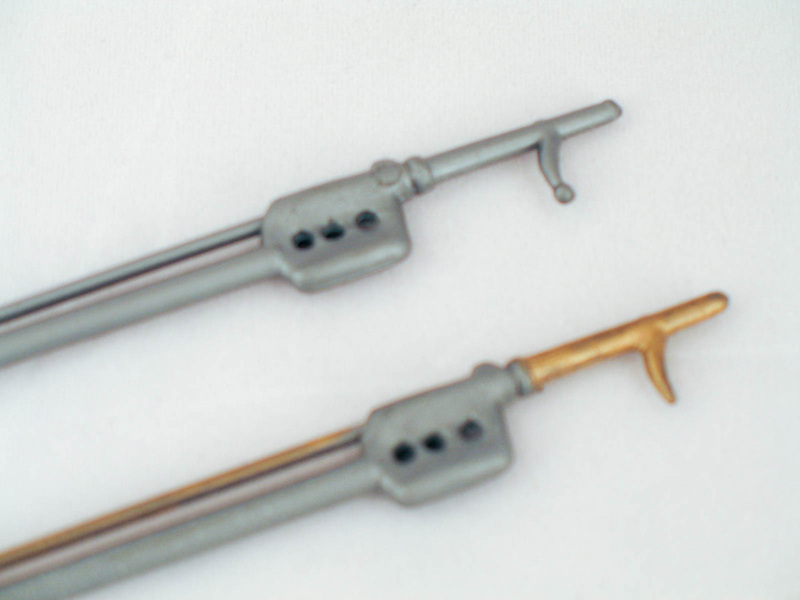 Top right the all diver knife, bottom right the silver spear gun with its safety tip on the barb above an earlier one with painted gold detail.